Michael Willems has been named chairman for the 2018 International Food Fest set for Feb. 3, 2018 at St. James Catholic Church's parish hall. His wife, Cathy Willems, also shown in the photo, will serve as co-chairperson. Both will handle a large share of the background preparations for the IFF. Preparations have been well under way for weeks for St. James Catholic Church's 10th annual International Food Fest set for Saturday night Feb. 3 in the St. James parish hall. Michael Willems took over the helm this past fall with the departure of Joe Giezeman and his wife Kathy who made a career move to Denver after serving as IFF chairman and co-chairperson respectively since its inception in 2008. "We appreciate all the diligent work Joe and Kathy did during their years of service to our churches (St. James and St. Richard, Searcy and Bald Knob, respectively), the IFF and the many communities," Mike Willems said recently. Mike Willems and his wife Cathy have played key roles in past years. Willems shouldered several logistical duties turning to several men from the church to make adjustments in and outside of the parish hall. One of the best features was the construction of a permanent walkway with temporary covering on the south side of the parish hall to accommodate patrons. Likewise Cathy Willems once again will work with other IFF volunteers in setting up rooms to allow patrons to move down the hallways selecting the many kinds of ethnic foods that will be available. 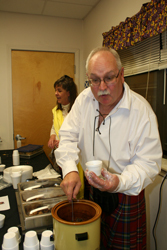 The Willems have also participated in the serving their own selected ethnic dishes. Father Polycarp SSebbowa became the pastor of the two churches last summer after Father Mathew Malapati departed for his native India after serving six years as pastor. During an early IFF Committee meeting last November Ssebbowa recalled his attendance at the 9th IFF last February as a visitor during his time as pastor at Catholic Churches in Batesville and Newport. A native of Uganda, Ssebbowa says he enjoys sampling various foods prepared and served by parishioners. In past years, ethnic foods spanned the globe from the U.S., Mexico, Germany, Puerto Rico, Holland, Italy, Scotland, Poland, Philippines, Belize, Nicaragua, India, Spain, Africa, Spain, Vietnam and other Asian and Latin American countries. Harding University and Harding Academy students along with those from area public schools have volunteered their time at the IFF. Aside from sampling ethnic foods, area businesses and industries and private citizens have provided items for the silent auction bidding. Jim Palmer, St. James parish council president, has handled the live auction donning an iconic Green Bay Cheese Head that dates back to the first and second Super Bowls he attended in the 1960s. Guest tickets will be sold in advance and at the door. They will be available at St. James Church, 1102 Pioneer Road, Searcy, St. Richard's at the corner of Hickory and Cleveland Streets, Bald Knob and church members. 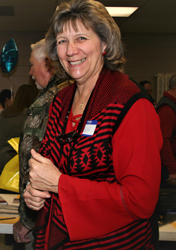 Roberta Spencer, St. Richard's parish council president, has coordinated the silent auction.